At City Pantry, we want you to get more from your lunch break. That’s why we work with London's best restaurants to bring the city's thriving food scene into your office. So, if you want to swap soggy sandwiches for Monty's Deli, Homeslice or Polpo, it's easy - just give the colleague who can make it happen a heads-up about us, and we’ll sort the rest. I hope you’re having a good day. Mine’s just been made better by coming across City Pantry, an office-catering platform that believes that teams that eat together work better. 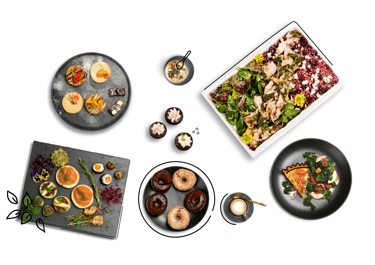 They work with over 350 of London’s best restaurants to deliver delicious food to offices across the city, and I think it would be great for us to try – you can check them out at www.citypantry.com. The City Pantry Plate-UpOur monthly round-up of what’s whetting our team’s appetite. New Vendor DigestEnjoy a taste of London's freshest and best, arriving at City Pantry every month. Meet the VendorGet to know the brains behind the capital's hottest restaurants. Drop your details in below — we’ll be in touch right away.